STANDING HT: 19.1' MACHINE HT W/RAILS: 78"
WIDTH: 30 IN. LENGTH: 72.5 IN. PLATFORM SIZE: WIDTH: 25.5" LENGTH: 62.25" W/EXT: 101.5"
Platform Size: 64" long x 26" wide + 3' extension. Gradeability: 25% Must be used on solid, level ground. 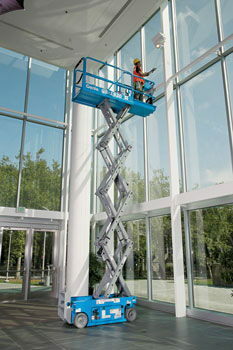 * Please call us for any questions on our scissor lift 19 foot rentals in Santa Barbara CA.